Per WarcraftPets, this skunk noncombat pet is obtainable by collecting 50 pets to achieve the Shop Smart, Shop Pet...Smart achievement. After hitting the 50 pet mark, the Reeking Pet Carrier item will appear in your mailbox, sent by none other than Breanni of WarcraftPets herself. Like what skunks should do, but anyways, not very special for farming 50 pets. Got mine now and i feel disappointed. As of 3.0.3 has a global cooldown like every other pet. Previously it had no global cooldown, and it could be used multiple times in a macro, creating a swarm of stinkers on the ground. Funny thing, in the mail the person who mails you Stinker says that the skunk "has a thing for black cats." Pretty obvious reference to Pepe Le Pew from Looney Tunes, always chasing that poor black cat. Say hello to my stinky little friend! This skunk will actually chase black cats around with a heart over its head. We've seen it work for the Black Tabby and Bombay, as both of those cats are black.! It would be interesting to have the skunk out when a mage uses the new Polymorph: Black Cat, and see if there is a reaction or if the skunk only targets other pets and not players or mobs. Pepé Le Pew is in WOW now it seems. Stinker is actually Pepe La Pue! The achievement itself is named after the saying Bruce Campbell says in the movie Army of Darkness. He works for S Mart, and he has to say Shop Smart Shop S-Mart. basically stinker is Pepe le pew from loony tunes cartoons. whos chases the cat who had the paint stripe down her back. I'm kinda surprised no one has posted the text from the letter yet. "I've heard how well you take care of our furry friends. I hope you don't mind, but I must get Stinker a new home. He just refuses to play nice with others. Please make sure to feed him twice a day and um... he has a thing for black cats. I don't know if this is something recent with the patch or not, but if you are near someone with Stinker out and someone else with a Black Tabby Cat out, Stinker chases after the cat with a heart over his head. After a long chase, he runs back with a broken heart. "Pepé Le Pew storylines typically involve Pepé in an unconsented-to pursuit of what appears to be a female skunk ("petite femme skunk"). 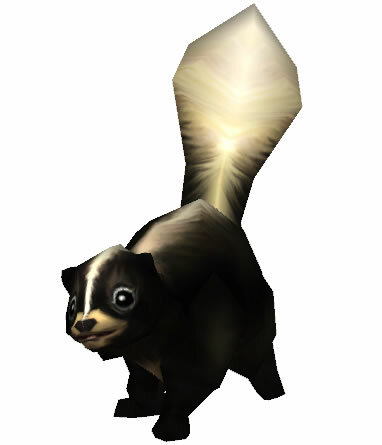 But, invariably, the supposed female skunk is actually a black cat (retroactively named Penelope Pussycat) who has had a white stripe painted down her back, often by accident"
Too bad , it doesn't chase alliance druids cat form. Was turned into a black cat tonight as part of the Trick or Treating-- Stinker didn't have any interest in me at all! I am going to hazard a guess that players as black cats (Trick or Treat, polymorphed) are immune to his skunky charms. Ah ma'cherie why do you run from me? I must kees and kees and kees! Being a druid, the moment i first summoned Stinker, I noticed it has the same model/animation as a bear. Anyone else notice that the rewards of the skunk, then the baby deer, might be in reference to Flower and Bambi? Wonder if the 100 achievement (if they ever put it out), will be a bunny reward aka Thumper, would be cute if so. Stinker is, hands down, the most awesome companion pet ever. He will pursue a black or calico cat with little pink hearts rising up above. The hearts will periodically shatter with an appropriate sound effect. The companion pets do not aggro bosses or mobs, so it can be wildly amusing to watch a small horde of animals running around underfoot. Now farts when poked enough. He'll also chase the Black Cat critters that appear around Hallow's End. He also chases the new Familiar Feline pet. Go into the 3D model viewer and zoom up on his face. For anyone asking, there DOES seem to be a reference to Thumper, Bambi and Flower. Since MoP it seems that after completing the achievment that this little skunky fellow will go straight to your pet collection. No mail. He also didn't appear for me until a day later. Right Click to summon and dismiss your pet skunk, Stinker.